Mr. Brown immediately resolved on her destruction and he forthwith directed one of his trusty shipmasters to collect eight of the largest longboats in the harbor, with five oars to each, to have the oars and rowlocks muffled to prevent noise and to place them at Fenner's Wharf, directly opposite the dwelling of Mr. James Sabin, who kept a house of board and entertainment for gentlemen, being the same house purchased a few years after by the late Welcome Arnold, and is now owned by and is the residence of Colonel Richard J. Arnold, his son. GENTLEMEN:—I now address you on account of a summons I received from you, requiring my attendance at the Council Chamber in Newport, on Wednesday, 20th inst. Now, gentlemen, I beg leave to acquaint you what renders me incapable of attending. In the first place, I am an insolvent debtor; and therefore my person would be subject to an arrest by some one or other of my creditors; and my health has been on decline these two months past, and it would be dangerous should I leave my house; and further, were I to attend, I could give no information relative to the assembling, arming, training or leading on the people concerned in destroying the schooner Gaspee. On the 9th day of June last at night I was employed at my house attending company, which were John Andrews, Esq., Judge of the court of Admiralty, John Cole, Esq., Mr. Hitchcock, and George Brown, who supped at my house and stayed there until two of the clock in the morning following; and I have not any knowledge relative to the matter on which I am summoned; which I am ready to make oath to before any Justice of the Peace. Obviously, Mr. Sabin is lying through his teeth in this account, as we know that there must've been over fifty armed and angry men at his tavern that night all intent on the destruction of the Gaspee. We therefore recognize James Sabin as an unindicted co-conspiritor in the Gaspee Affair. We have no evidence, however, that he actually took part in the raid itself, although it is certainly possible. As to his insolvency, we do know that he merely rented the building used for his tavern, and did not own it. He is buried in the Old North Burial Ground in Providence. He was 41 years old at the time of the Gaspee raid. We note also his name appearing in a list of owners of privateering vessels, specifically the Lark in 1779 (Field, Edward, State of Rhode Island and Providence Plantations at the End of the Century: A History. Boston, Mason Publishing Co. 1902, Vol II, pp424-430). Per the Early American Newspapers collection available through the NEHGS portal, we see that as early as May 1763, James Sabin was advertizing that he desired to collect all debts owed him or he would take legal action to collect. In the early 1780s his store on the West side of the Great Bridge was distiguished by the 'sign of General Washington' and had suncontractors selling patend medicines and horse saddles. In 1788 the copartnership of James Sabin and James Atwood was dissolved, and Atwood later opened his own shop nearby. In 1800 to 1802 Sabin's house was used as a hairdressing/barber shop. His short obituary in May 1806 indicates he was 75. After his death Sabin's store was taken over as a liquor, fireworks, and hat store. Timothy Sabin is located on the map at what would now be intersection of South Main Street and Williams Street., a couple of blocks south of the original Sabin Tavern location. S. Sabin is located at what is now College Street and where South Main becomes North Main Street. This location is adjacent to what was the Town Parade or Market Square in later years. The gaggle of Sabins located at 155 South Main Street indicate that they were all closely related, and their address across the street from Sabin's Tavern indicate it is highly likely that were all related to James Sabin as well. 155 South Main Street is no longer the location of Fenner's Wharf, long since filled in all the way past Water Street, and is now the site of The Packet Building (with a ship logo), presumably named after the packet ships that docked at the site long ago. The shoemaker, William located at 180 South Main Street would be, ironically, be located at what had been the original site of the Sabin Tavern. Definition: Tallow chandler--one whose occupation is to make, or to sell, tallow candles. Definition: Tallow--The fat of some other animals, or the fat obtained from certain plants, or from other sources, resembling the fat of animals of the sheep and ox kinds. This could be more commonly referred to as spermaceti candles, derived from whale brain matter, and for which the Brown brothers and Rhode Island were famous for producing. There does appear to have been a business operated by the Sabins back in 1835 located in Market Square, and based on the info above, perhaps it was a candle factory. On the other hand, we know from Caroline Frank (in "John Brown's India Point" Rhode Island History, Fall 2003 Vol 61:3 p 62), that one Hezekiah Sabin managed John Brown's gin distillery in the late 1790s while Brown was away attending US Congress. Perhaps this knowledge led to the formation of another house of spirits. 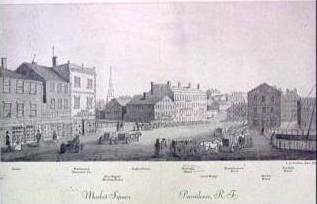 Right: "Market Square, Providence, R. I." 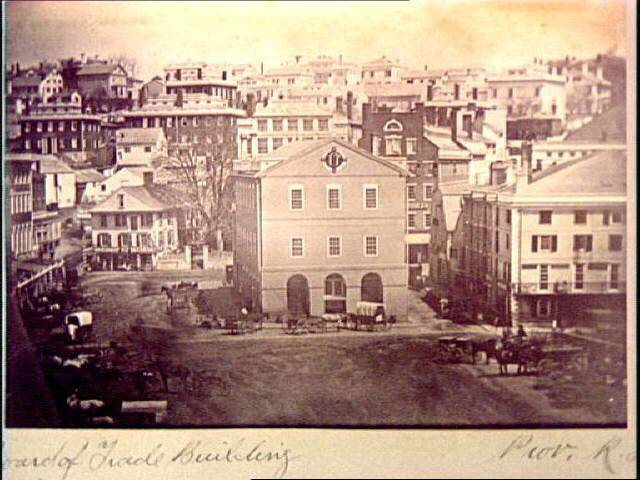 c1835 and in which buildings are labeled, left to right: Sabins, Washington Insurance Co., First Baptist Meeting House, Coffee-House, Granite Block, Market House, and Franklin House. Providence Public Library Collection wc 865. This is not the original Sabin Tavern, but was probably Sabin's spermaceti chandelry, assumably present at 11-17 Market Square. The original Sabin's Tavern of 1772 fame can be seen at our sister website History of the Sabin Tavern. James & his brother William (1741-1800) ran the Dolly Sabin Inn at Pawtucket, RI together for a time. Rehoboth of old extended into what is now East Providence, RI. Perhaps the Dolly Sabin Inn was named after their sister, Dolly Sabin (1737-1830). Pawtucket adjoins both East Providence and Providence, RI. There was bad blood between William Sabin and his older stepbrother David Sabin (1723) of whom he expressly cut out of his will. As to the Sabin Tavern, the establishment operated by James Sabin in 1772, the famous location wherein Rhode Island citizens met to plot the attack on the Gaspee; the original location was at the intersection of what now corresponds to 178-180 South Main Street and Planet Street in Providence. According to records from landowner Mary Morris, she had rented the building to Sabin for use as a tavern until December 1773, after which Sabin " purchased a tract of land on the west side of the river, near the Great Bridge, about where the Merchants Bank Building now stands, and left the tavern." So, what we conclude from all this is that James Sabin apparently came into some money by 1774 and moved the tavern location to a more central location in what was considered Market Square. Left: Drawing of "Old Tavern" c1848. Lossing relates that this was the site for meetings of the Sons of Liberty. From Pictorial Field Book of the Revolution by Benson J. Lossing . Vol I, 1850, Chapt XXVII. This second location of the Sabin Tavern is the source of some confusion from Benson Lossing's account in 1850, wherein he draws an old tavern, but places it at the beginning of North Main Street, which is where a photo taken in 1848 shows it to be, Lossing says that it was at this tavern that he drew, that the Sons of Liberty met. 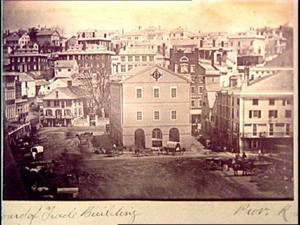 Right: Photo of Market Square in Providence c1845. The building in the center is Market House, aka Board of Trade Building. The possible second site of the Sabin Tavern is on the left and is identified in other photographs as the Manufacturers Hotel. We know that Lossing described the "Old Tavern" as forlorn, but at which time, and at least by 1835, it might have been known as Manufacturers Hotel and that it was torn down sometime before the 1870s and replaced by the What Cheer Building. The second site of Sabin's Tavern corresponds to the east side of the Great Bridge at Market Square. As to Mary Morris' reference to Sabin having purchased land on the west side of the Great Bridge, it is possible that that property was transferred to the extended Sabin family that operated the spermaceti works located there. That is, one adult male, 3 males less than 16 years old, 4 females, no slaves or other freepersons. We cannot account for the 3 males less than 16 in the household, but caring for extended family was common at the time. Hepsibeth Sabin b: 28 NOV 1721 in Rehoboth, MA. Married: 27 Jan 1765 in Providence, Providence, RI . But note the discussion below that the gravestone of Phebe Hammond (v Hamman) indicates that she was the Second wife, not the first wife, of James Sabin. Capt. James Sabin b: ABT 1768 d 1794 at sea, m Mary "Polly" Dexter , had two children. Obit of Oct 1794 says he died at Cape Nichols Mole at the same time and place as a Providence merchant, Mr. Benjamin Cushing., who was the son in law of Nicholas Cooke. Marriage 2 Anne Bicknell (c1753 -- 1802) daughter of Japhet BICKNELL and Martha TURPIN. Martha Turpin was probably the maternal aunt of Gaspee raider Turpin SMITH. Phebe Hammond is also listed as being buried with her husband in the Old North Burial Ground. She, like many other women of the time, probably died of complications related to pregnancy or childbirth, possibly with Katie Sabin, who has no dates listed and who is buried in the same cemetery. George L. Hammond was nice enough to research Phebe Hammond by visiting the gravesites of James and Phebe Sabin. The complicated fact is that Phebe's headstone next to that of James Sabin, list her as the second wife of James Sabin, not the first, and it further indicates that she was age 32 at death, confirming the year of birth given above as c1740, and that she was the Daughter of Jonathan Hamman. Contrarily, Phebe's mother's nearby gravestone is spelt Hammon. We suppose that literacy was a rare commodity in early America, and accurate spelling was even more rare. The variations of the family name, Hammond, Hammon, and Hamman are all pretty much identical when pronounced, and many grave markers are spelt phonetically, no doubt. Evidence demonstrates that James Sabin hosted the meeting where citizens plotted to attack the HMS Gaspee in 1772, then he lied to the Commission investigating the incident. We therefore recognize James Sabin as an unindicted co-conspiritor to those that burnt the Gaspee.